Published in the South Kent Gazette, 14 January, 1981. The widening of Frith Road is now forgotten but as late as 1884 it was little more than a narrow lane, no wider than its continuation, across the Barton Road junction, which leads to St Edmund’s EC Secondary School, The Danes recreation grounds and the cemeteries. The widening scheme brought a great improvement, providing a route from the London Road to Dover Castle, Deal and, later, the Duke of York’s Roval Military School, although the school was not thought of at the time of the widening. A substantial part of the northern side of Frith Road is taken up by the new Charlton Church and its churchyard. The church of SS Peter and Paul, superseding a much smaller church nearer the river, has its entrance in St Alphege Road, which is a cul-de-sac off Frith Road containing a row of attractive houses, including the rectory. This road was laid out by Mr J. N. Tunbridge in 1870, when he built on both sides of it 26 houses, and six more were added in 1884, when Salisbury Road was formed across its upper end. In laying out this estate, there was about £8,000 invested in road-making and drainage, and the buildings in 1906 were probably worth about £100,000. It was not part of the original plan to erect any houses fronting Connaught Road, for at one time there was not a finer promenade in Dover. It was a very pleasant walk for the aged and invalids, who did not care to climb to the top of the park; it commanded charming scenery, and was sheltered from the north and east winds. The upper part of the road joints Castle Hill immediately opposite the Constable’s Tower. The high land lying east of the Castle estate has long been devoted to public purposes. Looking down on the best residential parts of Dover, with the castle on its south-west, it is backed by a sheltering hill crowned by Fort Burgoyne; while in the northern valley, running towards Guston, are the Dover cemeteries, The Danes recreation ground and a playing field of the Girls’ Grammar School formed, originally for the boys’ school, out of the grassland that for years was called Cow Pastures. The most important part of this elevated land is Connaught Park. A century ago a public park was not greatly needed in Dover, for the extended range of the Western Heights was free for ramblers, and very close to the town were rural walks of unsurpassed attraction; but as the town extended landwards, and the fortification of the Western Heights curtailed the ramblers’ limits, there was an outcry for a recreation ground. About the year 1881, Mr Robert Chignell (who died in 1925) stirred up the leading people of Dover to meet the long-felt want. It was decided to provide a public park by voluntary subscriptions. The Department of Woods and Forests, on behalf of the Crown, agreed to lease the land to the corporation for 99 years, and the townspeople subscribed £2,700 for fencing, planting, and forming lawns and terraces. A committee, consisting of the largest subscribers, undertook the superintendence, Mr Chignell (who was one of the number) giving the benefit of his innate talent for landscape gardening; and they had the advantage of a skilful foreman of works in Mr Edward May. The land first taken in hand was about 25 acres, extending from the lodge entrance up to the gate opposite Godwyne Road; and when that was laid out, the late Dr Astley, as chairman of the provisional committee, handed over the key to the mayor on the 1st day of May, 1883. The park was from that time used by the public, but it was formally opened by the Duke and Duchess of Connaught on the 14th of July, 1883, when the Duchess planted a tree beside the park lake. Not long after the opening, the park was enlarged by taking the. whole of the hillside up to the Deal road, a third entrance being then, made opposite the castle. That addition made the entire area of the park thirty acres, and although the southern part has not much width, the addition greatly extended the length of the upper promenade, and made the park more accessible from the southern part of the town. 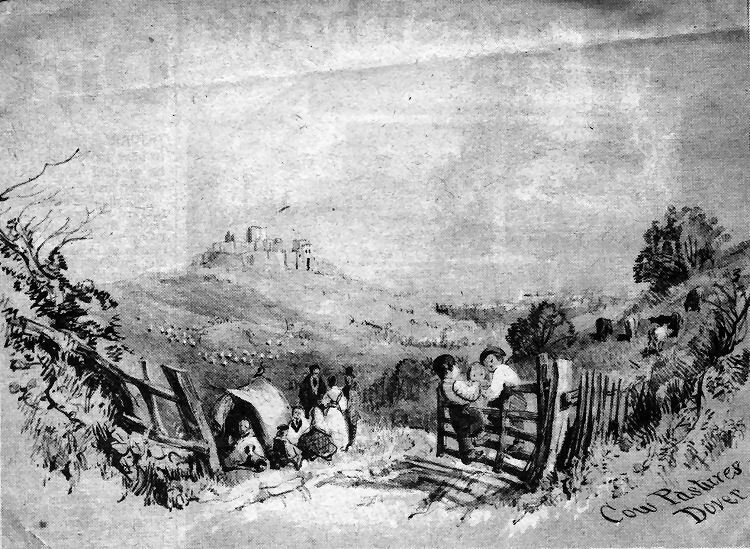 An artist’s fanciful impression of the Lons Hill slopes, from the region of Archers Court to Dover Castle, once known as Cow Pastures. Hundreds of houses, forming: Buckland Estate, cemeteries, schools, allotments, barracks and sports fields now span the area. The picture is believed to date from about 1845. The photograph above is an early one of the Castle Estate area off Maison Dieu Road, a glimpse of which is shown on the left in front of St Paul’s Roman Catholic Church. Beyond the church there is Brook House, and, a little to the left, the Maison Dieu. Nearly all the houses in the foreground have been demolished in recent years, the roads parallel with Maison Dieu Road being Harold Street, Leyburne Road and Castlemount Road on the right-hand side of which the houses remain intact. The view is from the site of the old Castle Hill Road.